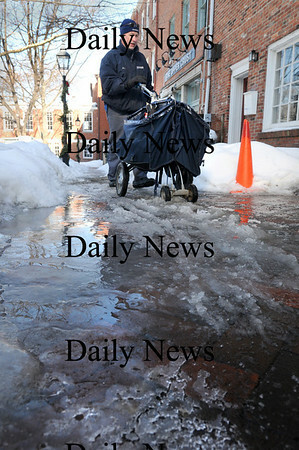 Newburyport: Letter carrier Bill Tremblay uses "stabilizers" on the bottom his boots to walk the icy streets and sidewalks of Newburyport's downtown area, here delivering mail to the back of businesses fronted on State Street. The strap-on device have small cleats attached which help to create traction as golf or football cleats. Photo by Bryan Eaton/ Newburyport Daily News Thursday January 29, 2008.